Once you arrive you’re assured of a warm welcome. We have a kids’ area to keep children happy, and canine family members are guaranteed dog biscuits. We stock a large selection of wallpaper designs, trade and designer paints, decorating accessories and tools – including sanding tools. We know our products well, so feel free to ask details when you’re considering your options. 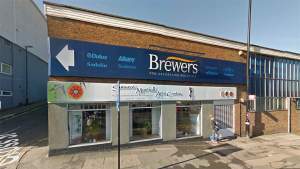 Brighton New England Street is one of two Brewers Decorator Centres in town – the other is on Freshfield Industrial Estate in Kemptown. New England Street is just off the A270 and the A23. If you’re following your satnav along New England Street from south to north, be aware that the road is split by Sainsbury’s – if you have difficulty, call us and we’ll talk you in. We’re right next to Enterprise Rent-a-Car. Travelling towards Preston Road, go under the bridge, then turn next right onto New England Street. With St Peter's Church on your right, take the next left onto the A270. Follow the road round, then bear left to find the store on your left.